You can remember a loved one tenderly with the Pink Cultured Marble Extra Small Urn by MacKenzie Vault. 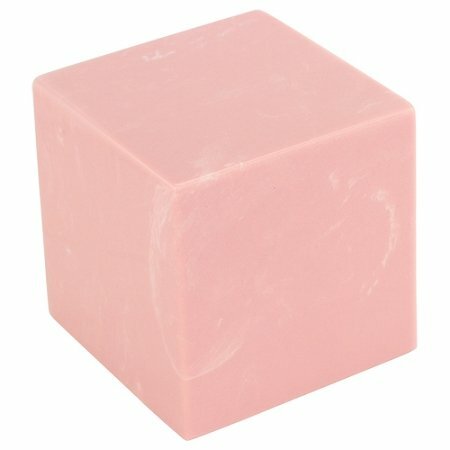 This beautiful cube shape urn can be used as a keepsake urn, or a full-size urn for an infant or small child.The Pink Cultured Marble Extra Small Urn for Ashes is powder pink in color with subtle swirls of cream, making this an appropriate and touching choice for a female.This is an extra small cremation urn with a capacity of 18 cubic inches, which is approximate to 1 1/2 cups. If used as an infant or child urn, it is appropriate for a loved one who weighed 18 lbs. or less prior to cremation. MacKenzie Vault products are hand-crafted to a high level of quality and workmanship from a precise blend of crushed stone, resin, and color pigments which work together to emulate natural elements. All of these materials are carefully selected for their strength, and enduring luster. Cultured marble appeals to many families due to the range of different colors available while still maintaining the look of genuine stone. Memorialization is a part of human nature. From performing rituals to the scattering of cremated remains from memorial urns, people have honored those who have passed away since time immemorial. For many, the act of memorialization provides stability in the months and years following the death of a loved one. Genuine marble: 5"w x 5"d x 3"ht cu. 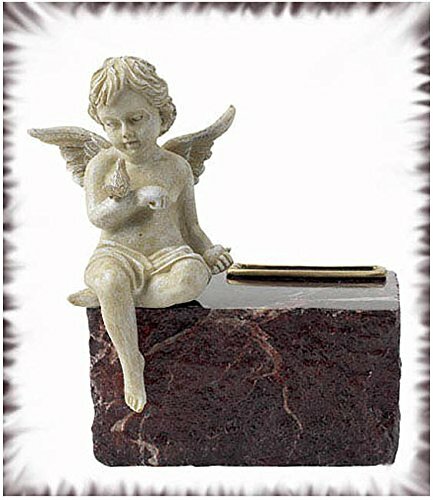 In: 17 bottom loaded Alabast angel: 4"w x 3"d x 5"ht, attaches to marble base with double-sides tape (included). Memorialization is a part of human nature. From performing rituals to the scattering of cremated remains from memorial urns, people have honored those who have passed away since time immemorial. For many, the act of memorialization provides stability in the months and years following the death of a loved one. Genuine marble: 5"w x 5"d x 3"ht, cu. 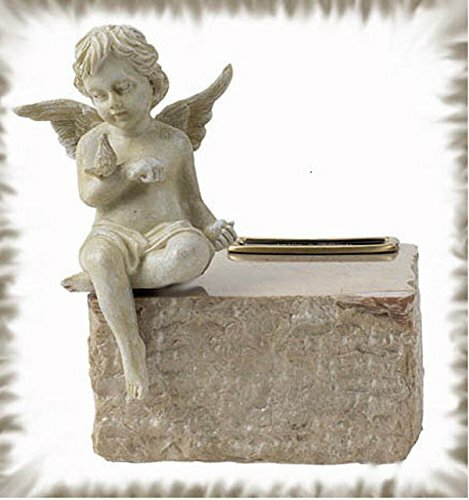 In: 17, bottom loaded Alabaster angel: 4"w x 3"d x 5"ht, attaches to marble base with double-sides tape (included). Remember and honor a loved one with the Navy Cultured Marble Extra Small Urn by MacKenzie Vault. 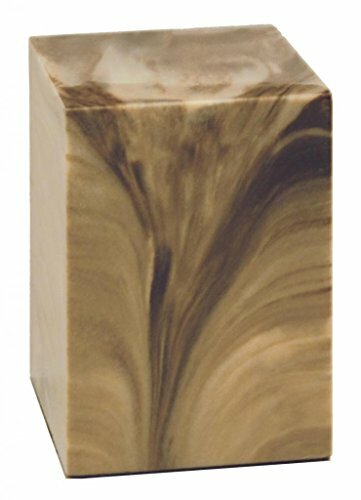 This beautiful cube shape urn can be used as a keepsake urn, or a full-size urn for an infant or small child. 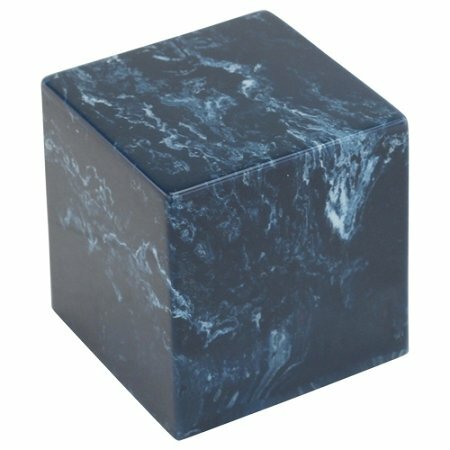 The Navy Cultured Marble Extra Small Urn for Ashes is dark blue in color with subtle swirls of cream. Crafted in the USA, this cultured marble urn is comprised of marble and stone dust, pigments and resin with the highest quality standards. Cultured marble appeals to many families due to the range of different colors available while still maintaining the look of genuine stone.MacKenzie Vault is the industry's most trusted name for cultured marble, onyx, granite and stone memorial urns. The MacKenzie Family has proudly served the funeral industry in the United States and Canada since 1897. This is an extra small cremation urn with a capacity of 18 cubic inches, which is approximate to 1 1/2 cups. If used as an infant or child urn, it is appropriate for a loved one who weighed 18 lbs. or less prior to cremation. 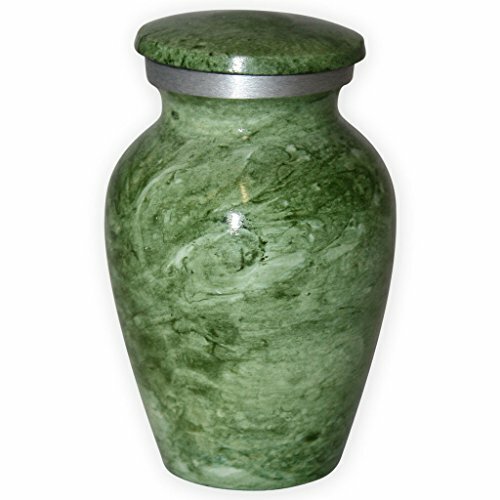 Honor lost loved ones with the uniquely designed Beautiful Life Urns Apollonia Green Keepsake Urn for Ashes, for funeral proceedings and far beyond. Affordably and ethically priced, this distinctive urn provides peace of mind and a truly beautiful resting place for your loved ones. The Beautiful Life Urns Apollonia Green Keepsake Urn measures approximately 2" long x 2" wide x 3" tall with a 3 cubic-inch capacity - about the size of a playing card. Suitable for a small portion of cremains. Also available in an adult size. Made of weighty, sturdy and durable metal, this cremation urn is ideal for homes with pets, children, or simply a lot of activity or travel. The tranquil, green painted faux marble finish brings a sophisticated, unique look. Ashes and cremains are kept secure and undisturbed with a quality, threaded lid closure. Celebrate and honor the memories of your loved ones with inspiring choices, affordable options and a dignified process from Beautiful Life Urns. Conscious of the stresses and frustrations the bereaved can experience from the funeral industry, we strive to offer a more peaceful alternative - beautiful ways to Celebrate A Beautiful Life. 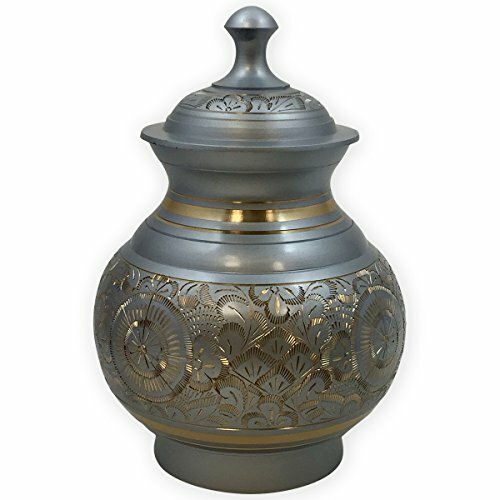 With an elegant gold engraving that graces the brushed silver finish, the Beautiful Life Urns Vienna Small Cremation Urn is a distinctive and sophisticated way to honor your lost loved ones. For funeral proceedings and beyond, this ethically priced and exquisitely designed metal urn gives you peace of mind and a truly beautiful resting place for your loved ones. 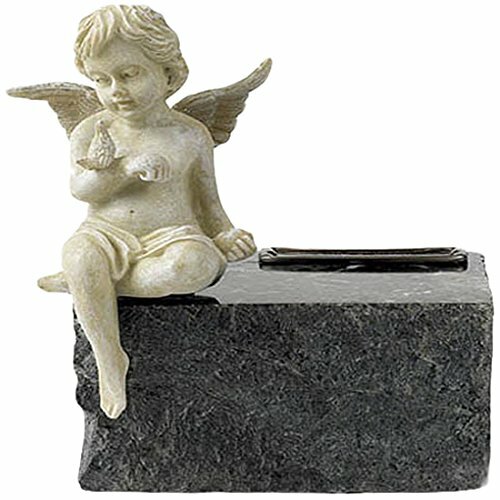 The Beautiful Life Urns Vienna Small Cremation Urn measures approximately 5" long x 5" wide x 7" tall with a 40 cubic-inch capacity. Suitable for a loved one weighing up to 40 lbs. prior to cremation. Crafted in fine brass, this sturdy and durable metal urn has a beautiful brushed silver finish decorated with a delicate gold engraving. Ashes and cremains are kept secure and undisturbed with a quality, threaded lid closure. Celebrate and honor the memories of your loved ones with inspiring choices, affordable options and a dignified process from Beautiful Life Urns. Conscious of the stresses and frustrations the bereaved can experience from the funeral industry, we strive to offer a more peaceful alternative - beautiful ways to Celebrate A Beautiful Life. With a painted blue surface finish and an exquisite gold etched design adorning the brass vessel, the Beautiful Life Urns Azure Adult Cremation Urn is a distinctive and sophisticated way to honor your lost loved ones. For funeral proceedings and beyond, this ethically priced and exquisitely designed metal urn gives you peace of mind and a truly beautiful resting place for your loved ones. The Beautiful Life Urns Azure Adult Cremation Urn measures approximately 6" long x 6" wide x 10.75" tall with a 225 cubic-inch capacity. Sized to hold ashes and cremains of a loved one weighing up to 225 lbs. prior to cremation. Also available in a keepsake size. 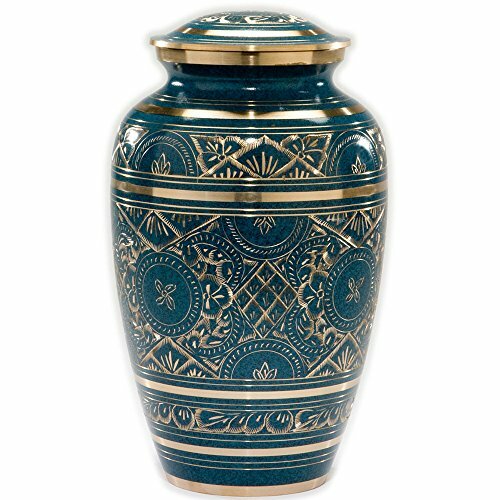 Crafted in fine brass, this sturdy and durable urn has an azure finish with elegantly detailed gold etchings. Ashes and cremains are kept secure and undisturbed with a quality, threaded lid closure. Celebrate and honor the memories of your loved ones with inspiring choices, affordable options and a dignified process from Beautiful Life Urns. Conscious of the stresses and frustrations the bereaved can experience from the funeral industry, we strive to offer a more peaceful alternative - beautiful ways to Celebrate A Beautiful Life. 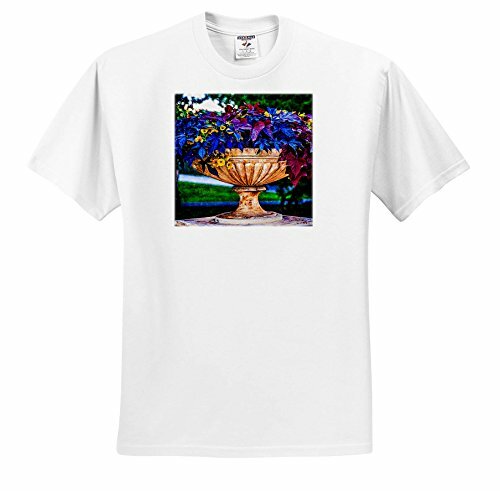 Colorful garden urn with plants and petunia flowers T-Shirt is a great way to show off your true style. Adult and youth sizes are a 50/50 blend of cotton and polyester, toddler sizes are 100% cotton. All sizes are available in white, grey, light blue and pale pink and feature a custom printed image. Made in USA. The Sitka is a infant urn in cultured marble. It has simple lines and is fine looking. It is available in seven different colors and can be personalized with your loved one's name, dates, and other remembrances or artwork. This almost indestructible urn is strong and secure enough to use as a ground burial urn, with no vault. Copyright © Wholesalion.com 2019 - The Best Prices On Marble Infant Urn Online.